Posted by Shelley Grell on December 15th, 2015. We’re very proud to have successfully coordinated key media placements for our client Canterbury Scientific in two of their top laboratory media in the US. 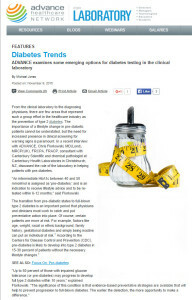 After introducing the scientific directors and their consultants to the science editorial teams, two feature articles and an interview on the subjects of diabetes and HbA1C were lined up for the respective November and December 2015 issues of MLO magazine and ADVANCE for Laboratory. In addition, to commemorate Canterbury Scientific’s 30th anniversary, we coordinated advertising in both publications (a mix of print, web and enewsletter) to complement the articles. 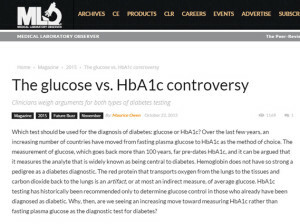 Read Dr Maurice Owen’s article on ‘Glucose vs HbA1c controvery‘ in MLO Magazine, and his feature article that explores the ‘Common Pathways linking obesity and Type 2 Diabetes’ in Advance for Laboratory. 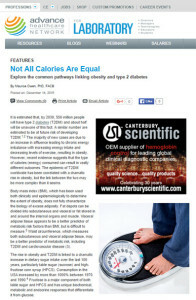 Canterbury Scientific Consultant, Prof Chris Florkowski, was also interviewed by Advance for this ‘Diabetes Trends‘ feature.